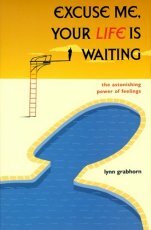 In an upbeat, humorous, and somewhat irreverent style, Lynn Grabhorn introduces us to the amazing Law of Attraction, a new and rapidly unfolding realm of feelings that physicians, scientists, physicists, and theologians are coming to believe is very, very real . . . Excuse Me, Your Life is Waiting clarifies why most of our dreams have never materialized, why the majority of us have lived with all-too-empty bank accounts, tough relationships, failing health, and often spiritually unfulfilling lives. Most importantly, in an easy-to-read style peppered with logical explanations, simple steps, and true-life examples, Lynn Granhorn shows us how to turn it all around -- right now. The most unconscious thing we do all day long is what actually creates and molds every moment of every day of our lives. And what is this "thing" that governs us so forcefully? Feelings! Grabhorn reveals how our feelings make our lives what they are -- not positive thinking, or sweat and strain, or good or bad luck, or even smarts, but feelings: good ones, bad ones, down ones, and all the ones in between. Until now, we have run our lives on a default setting, manifesting experiences by happenstance rather than intent. Now, with no effort other than paying attention to how we're feeling, the play becomes our own deliberate creation, and the world becomes our oyster.